Be sure to click on the images on the left to see larger, more detailed product photos. Available fur coloring is: White, Red/White, and Brindle/White. Functional reproductions from original woodcarvings. Each sits on a walnut plaque with skid proof pads. Hand-painted. Approximately 9 ½ inches high. $61 for one bookend and $120 for a set of (2) bookends. 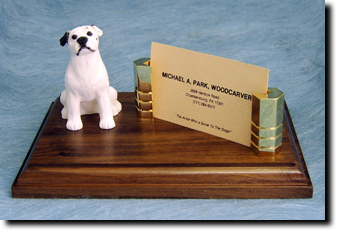 Figurine mounted on a 5 inches x 7 inches solid walnut plaque with 22-Karat gold-plated columns. Comes as a Figurine Business Card Holder. $67 each. Your choice of cast or hand-carved dog. Features stone wall case with Quartz movement. Operates on a single "N" battery. Hand-painted. Approximately 9 inches tall. 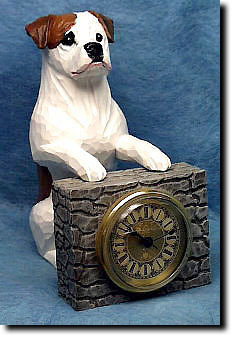 Cast Mantle Clock is $90 each and the Hand Carved Mantle Clock is $262 each. 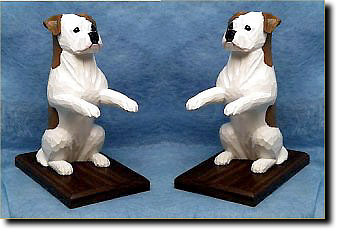 Figurine mounted on a 5 inches x 7 inches solid walnut plaque with 22-Karat gold-plated columns. 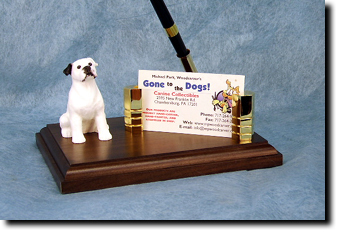 Comes as a Figurine Business Card Holder with pen and gold-base funnel. $73 each.